Rene Uzee published a novel last year that tells an epic tale of life in New Orleans long ago, the yellow fever epidemic of 1853, and the modern-day return of land taken from the rightful heirs many years ago. It's a story of political corruption, in New Orleans and also on a federal level, in 1856 going all the way to 2006. He started the whole story off with the yellow fever epidemic which killed over 9000 people in 1853, an epidemic which many people fled to St. Tammany Parish and particularly Madisonville to get away from. 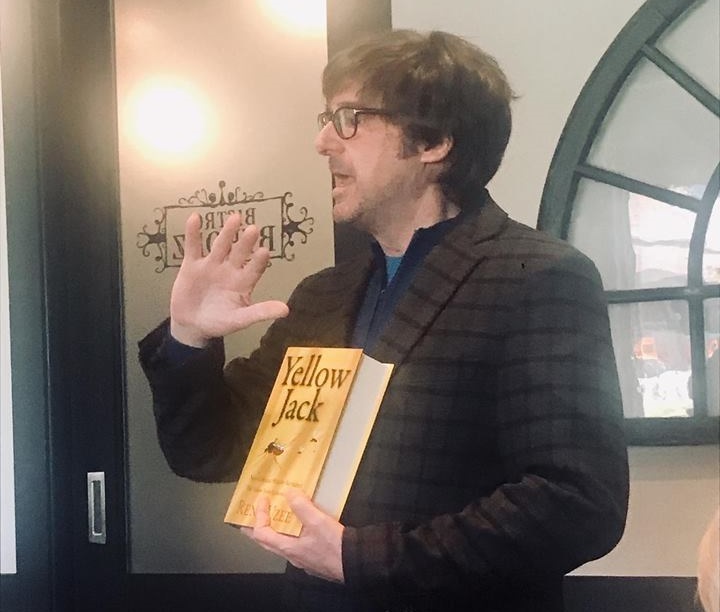 The book is entitled "Yellow Jack," and he started writing it in 2003. Fifteen years later, it's in bookstores and he's making the rounds holding book signing events and speaking to book clubs. "It all started with me looking up a little history," he explained in a phone interview last week. Uzee has never written a book before, and never thought he would write one, but once Yellow Jack started, it was a project he couldn't put down. He did thousands of hours of research to make it as historically accurate as possible (in a novel form). "Sometime it took me hours just to decide what kind of clothing I was going to put these people in," he said. "It was a lot of fun, though, I had a great time writing it." Doing historical research as background for a novel is always a challenge, because no matter how much research you do, there's always somebody out there who knows more about it than the research turns up, he says. The project started off as an eight page short story, then developed into 20 pages, then bumped up to 50 pages. So the story and the details about the story were an evolving, developing process. "I was really doing this planning to only print three copies: one for me, one for my mother-in-law and one for my wife," Uzee said. He didn't start out writing the story to "publish it." That was something he had never done before, and he was surprised when an editor told him that there was something "in him" that he never knew he had before. That's how the short story became a novel, and the encouragement he has received from all quarters has been amazing. He brought it to a professional editor to "have it done right" because he wanted it professionally worked up, even though he was planning to print only three copies. That person had been editing books for over 50 years, had a Ph.D. in history, and was a brilliant person, he explained. "She took the manuscript and read it, and then called me and asked what I was planning to do with this. When I told her I only wanted three copies for my family. She said, 'Rene, I can't let you do that." Taken aback, he asked her to explain what she meant. " You have done something here that you don't even know," she replied. She praised him for his work and encouraged that it be published. "This book is going to be so well-received, she said, and she told me that the book is movie material," he went on to say. "She told me that there would be interest from the movie industry." She predicted that his style of writing was so unique that people would be reading his book and studying his way of writing. "All the time I am listening to her saying all this, and I'm laughing inside, cause I'm thinking, this woman must be kidding me," he recalls. He printed 2000 copies of the book, about a year ago, and began to hustle, doing 40 book signings, giving speeches and visiting book clubs. "What she told me, I am starting to see it. I'm doing these book clubs and they are ex-professors and writers. And they are giving me these reviews, and I am literally weeping because I can hardly believe all this is happening. I didn't have any college education or anything." As of now, he's having a great time with it, especially now that a producer in Hollywood is looking at it. He's already converted the story to a movie script format. "It's just a crazy thing," he laughs. "It's the most surprising thing I've ever done in my life." He's already sold 1300 copies of the book since last year. He self-published his book and is doing his own marketing. "I wanted to be my own person with this and control what is happening with the book," he stated. He books his own radio interviews and personal appearances. "I did understand that a publisher could help you (but not really), they could promote you (but not really) because you wind up doing a lot of this yourself, anyway." "I'm not a know-it-all, but I wanted to learn how to do it all, and be my own person and have fun with it," he said. "Nobody is going to go out there and sell it more passionately than I am." He's now 59 years of age and has been cutting hair in his own salon since his twenties. He went through Katrina and moved from Arabi to Baton Rouge in 2007, where he is now. A definitely interesting part of the book are his characters, and when he was asked how he kept track of them all, he explained that early on, he just wrote extensive short stories about his characters and who they were individually. He would refer to these character stories over and over as he wrote his main book. "You really got to know each person's character, how they lived and breathed," he said. "And that was really important." Although there's a 150 year time span across the entire book, it all deals with the political corruption and cover-up that started in 1856. In the end, land that was stolen by government bureaucrats and politicians is returned to the rightful heirs, Uzee explains. The topic resonates with a lot of people apparently. "In my research I read about a lot of people who were heartbroken because their family lands had been taken from them," he said. "It's the story of outsider intelligent people who just came in, figured out how to take people's land and just took it." That story is still reportedly being played out in some Louisiana parishes, he noted. He was born in New Orleans in 1960, raised in Arabi, and moved to Plaquemines Parish in 1996. After Katrina hit in 2005, he moved to the St. Francisville area. Writing the book was a lot of fun, but the selling of it and talking to the people about the book and its subjects are even more fun, according to Uzee. He's also encouraging the people he talks with to pick up their pens and start writing their own books. "Sometimes they are scared to do that, and I just encourage everybody to just try to do it," he said. When he tells people he took 15 years to write the book, sometimes they say they could never work on something for 15 years. Then he just asks them, "What do you like to do? What do you take time to do to enjoy yourself?" Then they tell him, and if they have been doing it for their own enjoyment over the past 15 years, then that explains how he could have so much fun sitting down and writing his book. He's now working on his next book, already 14 chapters in, he said. This current book does have a chance to be made into a movie, however, and if it is, that will change a few things, he laughs. Then he might go national with a publisher and a publicist. Uzee is a cancer survivor who was diagnosed with leukemia in 2006, and was told nine months ago that he had beaten it. So he has a lot to look forward to, and as long as it continues to be fun, he will enjoy his success and his many new friends. As a passionate novelist he is paving the way for those many others who have their own story waiting to be told.